Scientists hope to "impart life with new forms and functions"
Scientists at The Scripps Research Institute (TSRI) have developed the first stable semisynthetic organism — a bacterium with two new synthetic bases (called X and Y) added to the four natural bases (A, T, C, and G) that every living organism possesses. Adding two more letters to expand the genetic alphabet can be used to make novel proteins for new therapeutics, according to the researchers. All life as we currently know it contains just four bases that pair up to form two “base pairs” — the rungs of the DNA ladder — which are simply rearranged to create different organisms. Until now. TSRI Professor Floyd Romesberg and his colleagues have now shown that their new “more life-like” single-celled organism can hold on indefinitely to the new synthetic base pair as it divides. Their research was published January 23, 2017, online ahead of print in the journal Proceedings of the National Academy of Sciences. 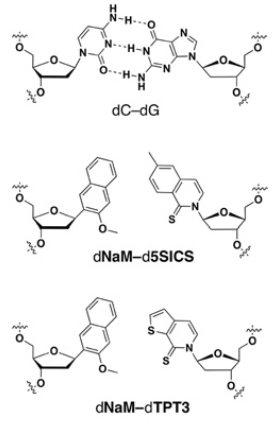 To ensure the new semisynthetic organism retains the new synthetic base pair as it divides, the researchers used CRISPR-Cas9 (a sort of scissors for modifying DNA). They engineered the organism to react to a genetic sequence that doesn’t have X and Y as a foreign invader (an immune response). So any new cell that dropped X and Y would be marked for destruction — leaving the scientists with an organism that could hold on to the new bases. In their experiments, that enabled their semisynthetic organism to keep X and Y in its genome after dividing 60 times, leading the researchers to believe it can hold on to the new base pair indefinitely. Romesberg emphasized that this work is only in single cells and is not meant to be used in more complex organisms. 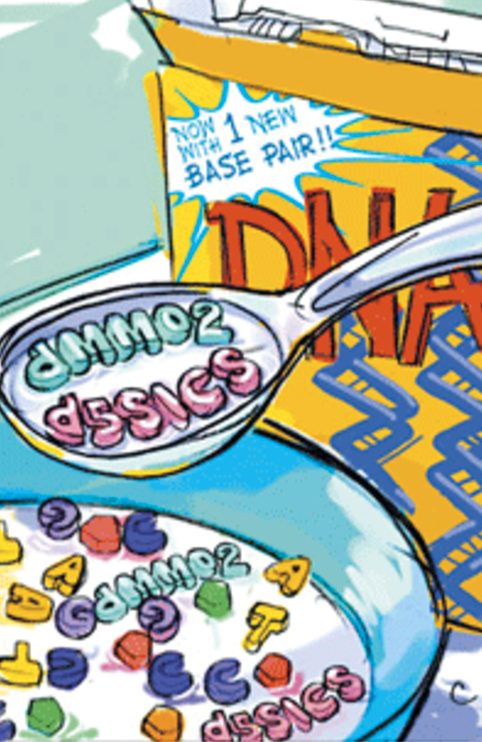 So far, scientists can only get the organism to store genetic information. Next, the researchers plan to study how their new genetic code can be transcribed into RNA, the molecule in cells needed to translate DNA into useful proteins. Scientists at the University of Grenoble and Henan Normal University were also involved in the study, which was supported by grants from the National Institutes of Health, theNational Science Foundation, the National Natural Science Foundation of China, Labex ARCANE, NanoBio-ICMG platforms, and a postdoctoral fellowship from the American Cancer Society. All natural organisms store genetic information in a four-letter, two-base-pair genetic alphabet. 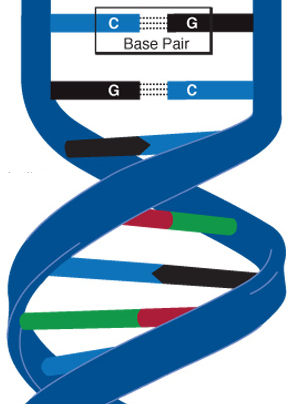 The expansion of the genetic alphabet with two synthetic unnatural nucleotides that selectively pair to form an unnatural base pair (UBP) would increase the information storage potential of DNA, and semisynthetic organisms (SSOs) that stably harbor this expanded alphabet would thereby have the potential to store and retrieve increased information. Toward this goal, we previously reported that Escherichia coli grown in the presence of the unnatural nucleoside triphosphates dNaMTP and d5SICSTP, and provided with the means to import them via expression of a plasmid-borne nucleoside triphosphate transporter, replicates DNA containing a single dNaM-d5SICS UBP. Although this represented an important proof-of-concept, the nascent SSO grew poorly and, more problematically, required growth under controlled conditions and even then was unable to indefinitely store the unnatural information, which is clearly a prerequisite for true semisynthetic life. Here, to fortify and vivify the nascent SSO, we engineered the transporter, used a more chemically optimized UBP, and harnessed the power of the bacterial immune response by using Cas9 to eliminate DNA that had lost the UBP. The optimized SSO grows robustly, constitutively imports the unnatural triphosphates, and is able to indefinitely retain multiple UBPs in virtually any sequence context. This SSO is thus a form of life that can stably store genetic information using a six-letter, three-base-pair alphabet.